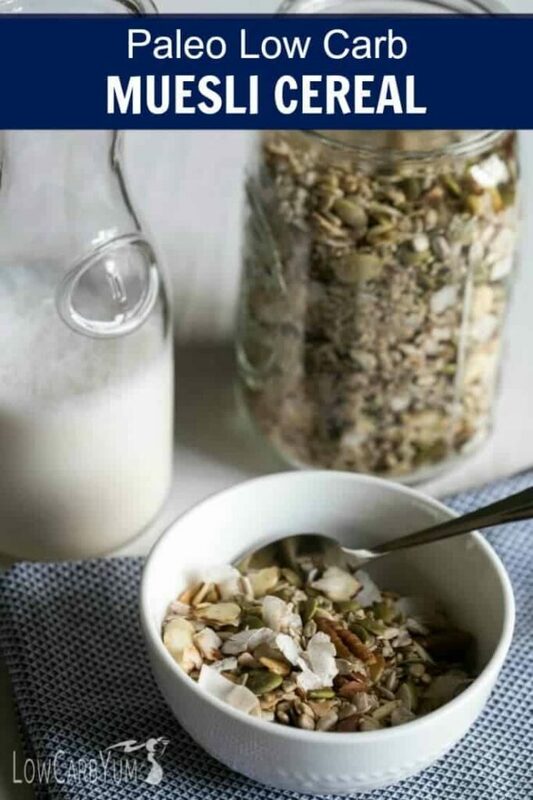 If you’re following a gluten free paleo diet, you’ll love this muesli low carb cereal. 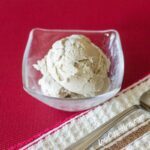 It’s loaded with whole food ingredients without sugar added! I’ve been hooked on the muesli cereal made by KZ Clean Eating. However, the price is just to high for me to continue eating it. A 500g bag of KZ Clean Eating Cereal is pricey, even with free shipping on Amazon Prime. Looking at the list of ingredients, it’s just a blend of coconut, nuts, and seeds. There’s also some sweetener, vanilla, and cinnamon added. I knew I could come up with my own low carb cereal recipe at a fraction of the cost. All of the ingredients are easily purchased at my local grocery store. 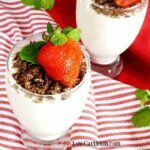 That makes this low carb gluten free musli cereal recipe very convenient. 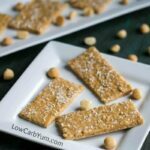 I can whip it up this low carb cereal quickly whenever needed so I’ll always have it on hand for a quick meal. I often eat a bowl with some unsweetened almond milk when I come home hungry after work. 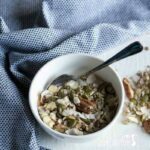 Making a batch of homemade low carb gluten free musli cereal is so simple. 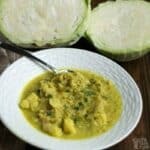 You just dump everything in a large bowl and stir it together. Then, you’ll want to bake the mixture to make it crisp. 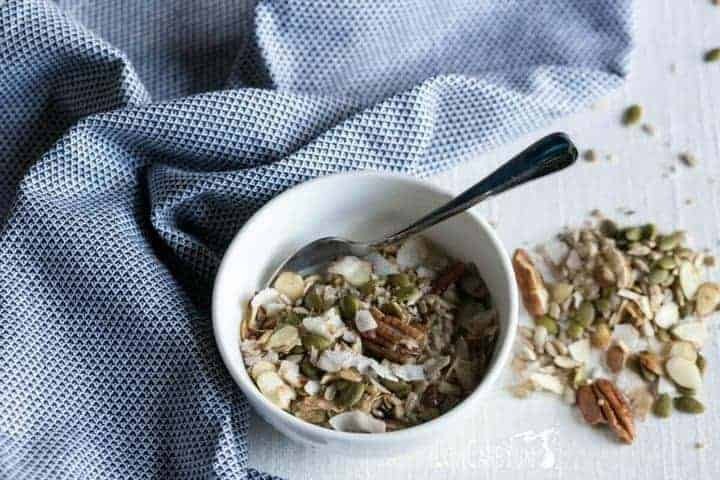 When I made my first batch of this gluten free musli cereal, I didn’t bake it. it was not as crispy as the KZ Clean Eating Musli Cereal. So, I spread the remaining cereal out on a jellyroll pan and toasted it in the oven for about 8 minutes. That did the trick! Feel free to change up the ratio of ingredients if desired. 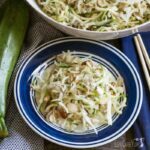 I love coconut so I may start making it with more coconut flakes. 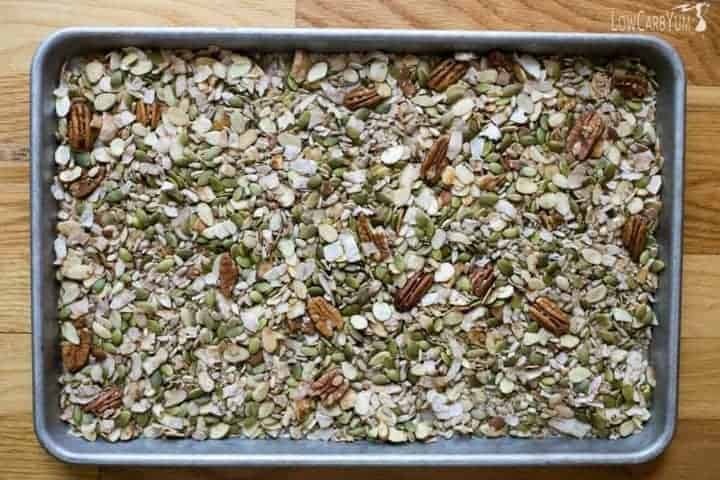 This is a really hardy cereal and it’s paleo friendly. Cereal is one of those convenience foods. 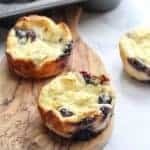 It’s makes a quick breakfast before work or a filling snack during the day. 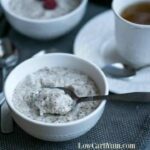 And, this low carb gluten free musli cereal is a cinch to make at home. The KZ Clean Eating Musli Cereal doesn’t add hemp hearts. I had some on hand and thought they’d be a great addition. And, they were! You should be able to find all the ingredients in this musli cereal in your local grocery or natural food store. If there’s a particular ingredient you can’t find, leave it out or sub it with another nut or seed. 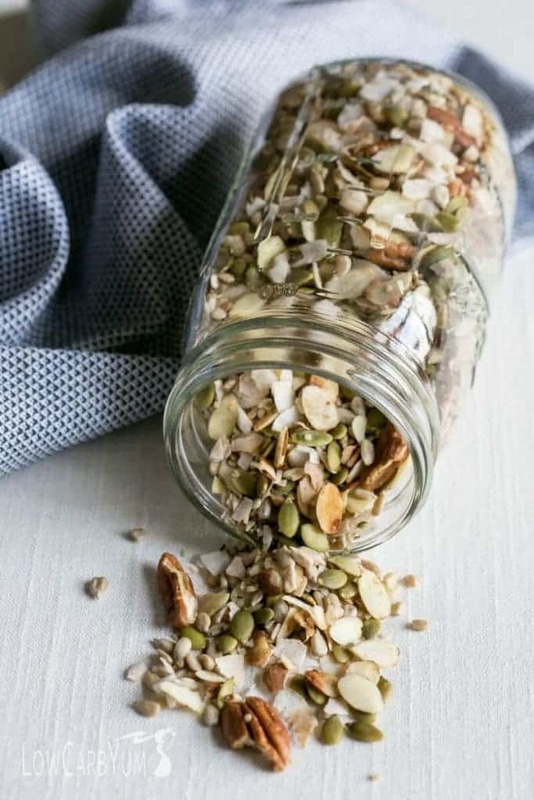 If you have a nut allergy, you could make the cereal entirely from seeds. But, the nuts really give a great flavor for those who don’t have issues eating them. A lot of musli cereals add fruit. 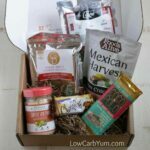 You could add a bit of unsweetened dried cranberries or stevia sweetened dried cranberries or low carb dried barberries. I wouldn’t add too much fruit, but about 1/4 cup or a bit more would be a nice touch. 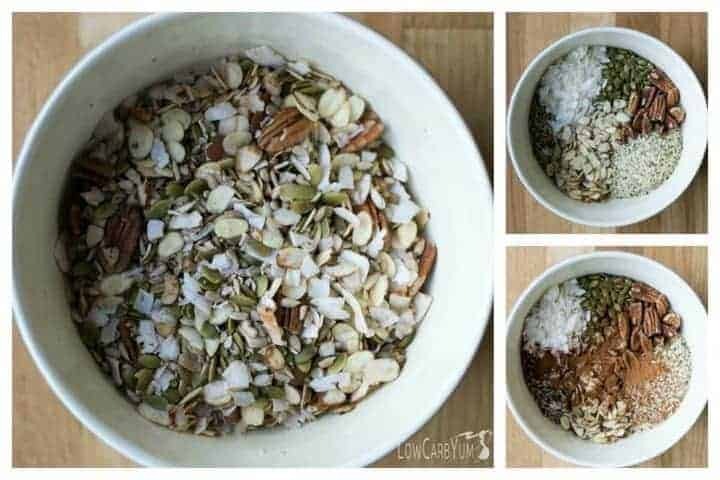 If you're following a low carb paleo diet, you'll love this low carb gluten free muesli cereal. 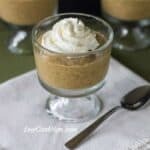 It's loaded with whole food ingredients without sugar added! In large bowl, stir together all ingredients until well combined. Lay out on a rimmed baking pan and bake at 350F for about 7-8 minutes. Allow to cool. Store in air tight container. Each serving is about 1/3 cup. 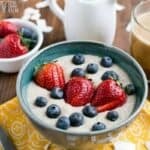 Tastes great with almond milk!